Florence is a beautiful city located towards the north of Italy. It's been popular with tourists and art lovers for years because of its cultural sights and great shopping, and it's one of those places that you really should take the time to visit if you're ever in the region. And while a short break in this fashionable city is always guaranteed to delight, the surrounding region of Tuscany offers plenty more fabulous places to visit. Next time you're in Florence why not try one of these great day excursions to see some of the quieter, less touristy towns. Sardinia (Photo credit: giannisl)So you have decided to go to Sardinia, a Mediterranean island southwest of Rome. You can see their bronze age stone fortresses called nuraghi that are found nowhere else on earth. 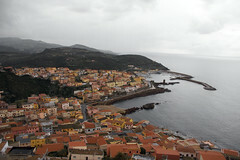 To a large extent Sardinia is the most traditional part of Italy. But it is also home away from home for jet setters who haunt the Costa Smeralda in the island's northeast. I'm told that the Presidential Suite at the Cala di Volpe has a private pool. On the other hand Costa Verde at the opposite end of the island is only accessible by unpaved roads. The local mines have been abandoned. Try to get there before it's "developed." Sardinia is known for unusual food such as Cavallo (horse meat) and Ricci (sea urchins). If you feel lonesome for Aragosta (lobster), Sardinia is perhaps your best bet in Italy but remember to bring your wallet. One of the great things about visiting Italy is that each region is almost like a different country. Each region has differences in dialect, cuisine, architecture, and topography. Italy is no stranger to great cuisine. It is virtually impossible to not have a good meal in Italy. However, there are certain regions where the cuisine is more noted than others. Recently become renowned for its cuisine is the Piedmont region of Italy. Piedmont, which in Italian means, at the foot of the mountain, is located just south of the Alps in the northwest region of Italy. It is a very industrialized region, being home to Turin, the automobile capital of Italy. The restaurant scene is now bursting with progressive and avant-garde type cooking. So you have decided to go to Campania, a region of southern Italy bordering on the Tyrrhenian Sea. This beautiful region contains the ancient cities of Herculaneum and Pompeii, which were preserved forever by Mount Vesuvius almost two thousand years ago. Then head west and see Naples, the regional capital that was once the third largest city in Europe. Go underground to visit the vast network of Greco-Roman reservoirs and tunnels. Of course there is quite a lot to see above ground such as the Palazzo Reale (Royal Palace) and the Castel dell'Ovo (Egg Castle) in addition to lots of museums and historic neighborhoods. As always, keep a close eye on your belongings. To the west of Naples you'll find several towns worth visiting, such as Baia, an Ancient Roman resort. Make sure to check out the Isle of Ischia with its beautiful gardens. If you have the time and plenty of money stop by the Amalfi Coast and the Isle of Capri, very upscale tourist destinations. So How Exactly Do Italians Stay Slim? After travel, our next greatest passion in life is enjoying good food, and so our recent trips to Italy left us with not only wonderful memories, new travel ideas, and great holiday snaps, but it also left us with a whole lot more than an inch to pinch! A country passionate about everything from the way they speak to each other (hands and all! ), the way they dress (don't forget the sunglasses! ), and the way they cook, the Italians certainly know how to live life to its fullest, and their Mediterranean style of cooking tickles the taste buds in all the right places. From teeny tiny espresso's and sweet treats for breakfast, to pizza lunches, and pasta and salad evening menus, they really know how to create a delicious meal from simple ingredients, and that's before you even get started on the gelato! The Vatican is a truly unique state within a city, a city-museum which is inextricably linked to the history of the Roman Empire. Here, unique works of the best artists of all ages can be seen literally everywhere. Temples, palaces, museum collections of ancient art, masterpieces of Italian painting and sculpture are noteworthy and attract the guests' attention. Despite the small area of the Vatican, it is widely known throughout the world. The sights of this city make it very attractive for tourists. One of the most beautiful architectural monuments of the Vatican City is the St. Peter's Cathedral. It is located on St. Peter's Square, designed by the famous Bernini. It has an oval shape and is surrounded by a row of pillars, which includes four rows of Doric pillars crowned by a balustrade with the statues of saints. In the center of the square, there is the Egyptian Obelisk, which was brought to the Vatican by Caligula, and two fountains built in the 17th century. Travel Money - Which Currency Should You Take on Holiday? With the Eurozone in turmoil yet again and the ever-fluctuating exchange rates, it can be difficult for holidaymakers and travellers to know how, when, and where they should exchange their hard-earned cash into foreign currency. Greece is getting more than its fair share of bad press at the moment, and while there seems to be a real threat of them exiting the Eurozone and the Euro currency, holidaymakers are still being encouraged to visit the Greek Islands and take advantage of the cut-price deals available. In the event that Greece does return to the Drachma during the summer months, there will almost certainly be a transition period where both Euros and Drachmas are accepted, but tourists are being advised to take a mixture of cash (Pounds and Euros), a credit card, and a prepaid card, to cover every eventuality. Holiday Insurance is also highly recommended, and if you book your trip through an ATOL-bonded tour operator, your flights and accommodation will be protected. If the 'Grexit' does take place the Euro will most certainly be affected, and so anyone travelling within the Eurozone should probably hold onto their pounds, dollars, and any other foreign currency for as long as possible, and exchange just before you leave home or when you arrive at your chosen destination. Credit and Debit cards are by far the easiest and often the cheapest way to get hold of your holiday spending money, and providing you bank or CC provider does not charge you an excessive amount for withdrawing cash abroad, you can benefit from up-to-date exchange rates directly from the bank. From Florence, you can take a rental car and drive through the beautiful wine country down to San Gimignano, an example of Renaissance beauty. This town is famous for its medieval towers that will impress you very quickly as you approach the town. There is a charming old part of town that is easily accessible on foot. You can check out some of the restaurants, shops, alleyways and piazzas. Be sure to savor some of the local white wine called Vernaccia di San Gimignano. In today's modern "mobile" world of internet savvy travellers, packing for a trip abroad is no longer just about suntan lotion and a good book, it's all about the travel gadgets! From iPads, iPods, and iPhones, to Kindles, portable DVD Players, and of course, cameras, it seems we are more concerned about packing the right electrical goods, than the right outfits as we head off on our summer holidays, and as a result, we now carry more gadgets ever before. While I do like to check my emails while on holiday, my phone is the last thing I want to hear ringing as I sink into the sun lounger - but it seems I am one of few! The iPad - Compact, convenient, and incredibly useful, the iPad is quite possibly the best mobile device available on the market today. It finds the closest WIFI connection in seconds, it's a camera, a movie player, it's a games console, and it's perfect for anyone who wants to stay connected abroad! What to see in Tuscany, Italy is not something that should often be asked since there is so much to see and do. Whether on vacation or conducting business in the area, there are plenty of sights and adventures to take part in. Tuscany is a large region located in the north central part of Italy. Known for its beautiful landscapes, artistic legacy, and sophisticated culture, Tuscany is said to be birthplace of the Italian Renaissance as it is home to several individuals who were influential in the history of science and arts. Tuscany is also known for its fine wines and culinary tradition. For those looking for things to do in Tuscany, below are a few things to consider. I know this doesn't sound very patriotic, but I one of the "millions of Britons" who will be escaping to warmer climes when the London 2012 Olympics start in July. Not that we didn't try to support the event, my better half tried for months to get hold of some elusive Olympic tickets, but this was to no avail, and so I am afraid we will be joining the flock heading off our tiny island in search of sun, sand, peace and quiet!